This file contains a booklet wit the rules and regulations of the Cemetery (published 1992), along with a promotional leaflet, a copy of the program from the 125th anniversary celebration (June 1997) and a rate sheet from 1997. This file contains the notes from an address given by William H. Finkle (1894-1973) at the 22nd Club on March 22, 1962, Mr. Finkle reminisced about his life in Belleville. This file contains three original Public School Daily Register for Recording the Attendance of Pupils in Belleville School #3 for the years 1893, 1894 and 1895, in the City of Belleville. File contains a newspaper clip on the last meeting of the purity campaign, with Mr.McCraig speaking on causes of divorce, and purity pledges. File contains a 1968 newspaper clipping of a column, "Second Glance" by Viva Richmond Graham. File contains a typed copy of a newspaper account from 1882 of weddings in Belleville between prominent families. The file contains a tribute to Betsy Dewar Boyce from the Hastings County Historical Society, written by Gerry Boyce, September 2004. File contains family tree following the marriage of William Campbell and Isabella Mason and a pamphlet celebrating the centennial (1832-1932) of the Campbell Clan. File contains the family pocket bible “The Psalms of David” with a pink ribbon from 1930 and a list of Campbell family births from 1879-1892. 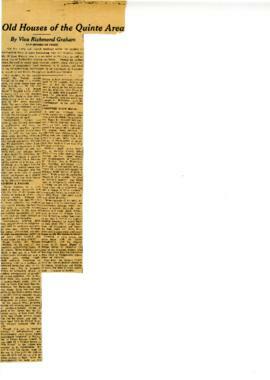 File contains a newspaper clipping from the Stirling News Argus about the sudden death of James Angus Campbell in 1956. Newspaper article on the Cannifton house. File contains miscellaneous documents found at 70 Cannifton Road. Cavanagh and McKimm families. File contains original 1877 diary for Francis Mason Clarke; a brief biography written by his great-granddaughter Katherine Mills (2003); photo and obiturary from the Daily Intelligencer, April 17, 1929. File contains the marriage register of Stephen Conger, J.P. Hallowell from 1803 to 1823.